:These stickers feature a classic, illustrated face of Jesus Christ and are a great resource for boys and girls at church, home, Sunday school classes, or preschool. Approximately 1" x 1 " each, they can be used for Easter crafts, Bible stories, and more. Six sheets, 9 stickers per sheet; 54 stickers per package. 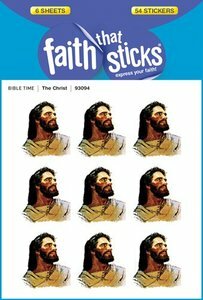 About "The Christ (6 Sheets, 54 Stickers) (Stickers Faith That Sticks Series)"